Spend & Sweep with goodies worth up to RM 100,000! Chevron Malaysia Limited, which markets the brand Caltex®, recently announced its latest exciting initiative – the “Spend &amp; Sweep” promo campaign, in partnership with local hypermarket chain MYDIN. 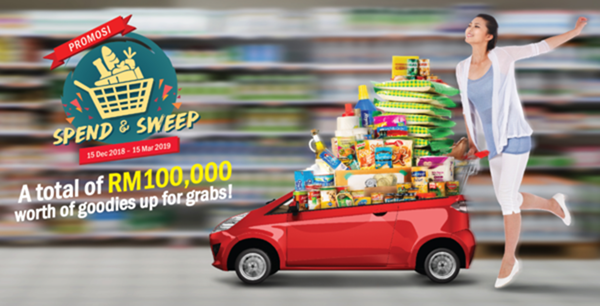 Just like how Caltex speeds through challenges, participants will only be given three (3) minutes to grab as many items as they can if selected as a winner for the shopping sweep. 10 lucky contestants from Kuala Terengganu had an exciting time during the first session of Spend &amp; Sweep at MYDIN Bukit Mertajam. With the next session set to be held in MYDIN Gong Badak and the final session to be held in MYDIN USJ, Caltex is calling out to all Malaysians to stand a chance to grab the highest amount in just 180 seconds by heading over to the nearest Caltex service station and/or MYDIN outlet to take part now! For more information on the Caltex® Spend &amp; Sweep Promotion, please visit www.caltex.com/my or follow their official Facebook Page at https://www.facebook.com/Caltex.Malaysia/ for the latest updates.